When we take photographs now of our loved ones or family, what happens to them? Now, more and more, our photos and precious moments are uploaded onto giant servers in the ether often never to be seen again. Most of us know about Google albums where most of our photos are uploaded, or about the legions of photo folders on our computers where sometimes very precious moments get lost in ‘folders’ purely because the ease of taking images on our phones has changed the way we capture things. In todays digital age we no longer treasure family photos as we used to, because, often, they don’t actually exist. We don’t perceive them as being unique items, we think we can acccess them at any time from a server in the ether somewhere. They are not art objects any more. What is going to happen to all the Instagram/Twitter/Pinterest images you have lovingly compiled and created. Do they even belong to you? A painted portrait is a different animal, it lasts forever and is real. It is a tangible thing now, with a life of its own, that you live with and look at on a daily basis. It changes in different light. its a physical object that the artist has spent a long time creating for you that may give you great pleasure or comfort. As a record, interpretration of someone you know or love or a fleeting moment that is entirely personal to you. A painted portrait by Furr is likely, in fact, to become a family heirloom. A portrait isn’t just a photograph, however small, it’s a personal interpretation of you or your loved ones by the artist. It’s there to capture the essence of a person, in a totally unique way. 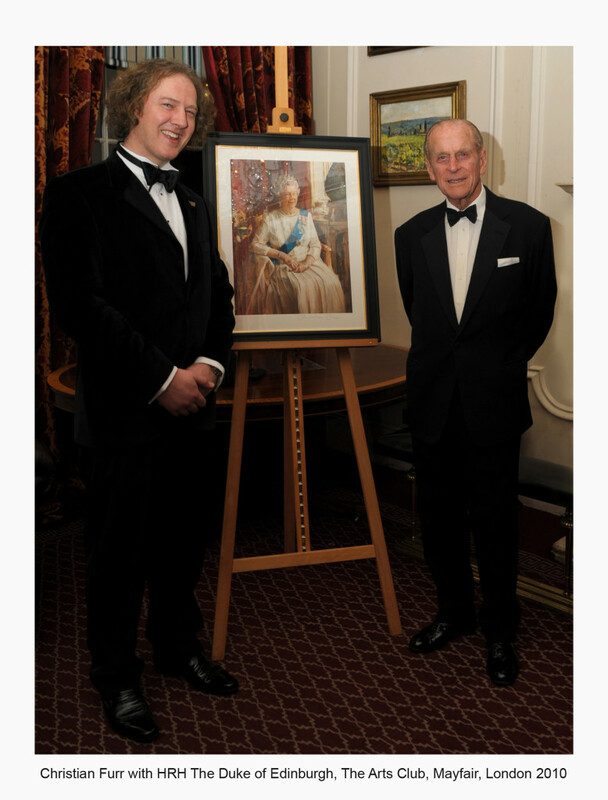 HM Queen Elizabeth II chose chose Furr to paint her portrait in 1995. An initial meeting will be arranged with Christian. For the artist, It is good to meet the subject – or the person who is commissioning the portrait – before he embarks. For various reasons – to know what you like and what your tastes are and to also find out about you as a person before embarking on the project. After all you are commissioning a piece of Art that will become a family heirloom or an investment for your organisation. This is not an everyday experience – it is a unique one – and you need to know that you are choosing the right artist for your portrait. To be assured that you are putting your faith in someone you can trust. Prior to the sitting, you can if you wish, meet the artist initially. Christian Furr is a member of the Chelsea Arts Club and it can be arranged to meet here or at your convenience at a place of your choice. You may have been thinking about having a portrait painted for some time – or it could be a thoughtful last minute gift – either of your partner, yourself or of your children, your family or a special member of your family. Furr says ‘I aim for psychological truth in my work. I believe that once you have placed your trust in me to produce a portrait for you, you will be, at the least, extremely satisfied with the result.’ If necessary referrals from previous sitters can be supplied that attest to this. The process is simple. The sitting can be carried out according to the subject in different locations. At your home, place of work or at the studio in London. There is one photographic sitting that takes a couple of hours maximum. From these images, in the studio, Furr decide what will work as a painting for you. The portrait process for him is often a collaboration. Before proceeding you will receive a contract outlining the schedule and last date that the work will be complete by, depending on the artists waiting list and your needs. There is deposit payable on signing of the contract. You will be guided step by step through the process so all you have to do is look forward to enjoying the unveiling and the piece of highly personalized and unique art by Christian Furr that will become part of your life.